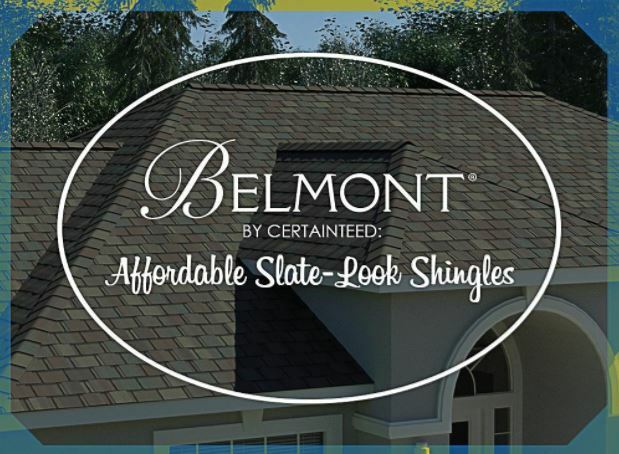 CertainTeed has recently announced their new affordable luxury roofing product line, the Belmont™ shingle collection. As one of the select roofers in the Northwest Indiana to receive CertainTeed SELECT ShingleMaster™ certification, Rogers Roofing can’t be more excited to share this new product with you. The Belmont shingle collection is an asphalt laminate roofing shingle that combines state-of-the-art performance with the natural beauty of slate roofing. Thanks to its contrasting shadow lines and carefully selected color palettes, it achieves a natural slate look. It also meets UL standards for fire, wind, tear, and impact resistance. Belmont by CertainTeed is far from just another asphalt shingle product that mimics slate roofing. It’s crafted from two laminated asphalt layers and coated with a rich granule blend that creates distinct shadow lines, making it indistinguishable from real roofing roofing when viewed from the curb. And to better match the color variations in real quarried slate, Belmont is available in six classic color options. Slate roofing is much heavier and costlier than asphalt shingles and can only be installed on certain roof slopes. Existing roof decks often have to be modified before they can accommodate such heavy roofing, even if it’s still in good condition, which could cost you even more. Belmont shingles let you keep your existing roof deck, and as a component of the CertainTeed Integrity Roof System®, you can be confident that your roof will provide complete protection for your home, from the underlayment to the ridge caps. All CertainTeed roofs installed by a CertainTeed SELECT ShingleMaster are eligible for the Enhanced Lifetime Limited Warranty coverage that offers lifetime protection from manufacturing defects. A 10-year non-prorated SureStart™ protection covers material and labor costs. On top of that, we provide our own Lifetime Workmanship Warranty, meaning we will provide workmanship warranty coverage for as long as you own your home. If you would like to know more about Belmont shingles or our roofing services, call Rogers Roofing today at (219) 228-8210 (Indiana) and (773) 492-2270 (Illinois). You can also fill out our contact form for a free roofing estimate. We serve many areas near Northwest Indiana, including Orland Park, IL, and Crown Point, IN.